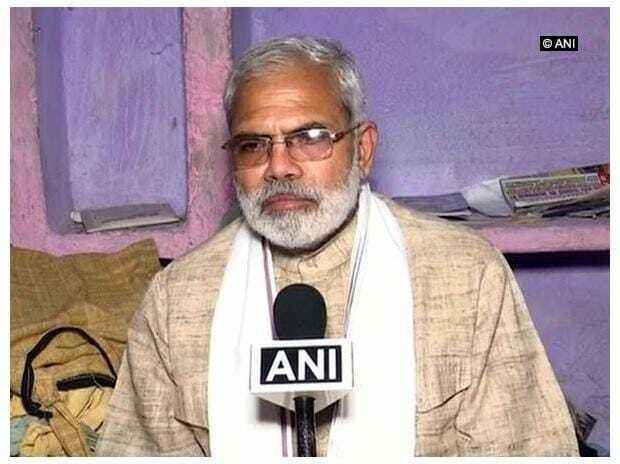 He looks like Prime Minister Narendra Modi, dresses and speaks like him and begins his speech with 'Mitron', but their similarities end there -- He is Abhinandan Pathak, a Congress campaigner in the Naxal-affected Bastar region of Chhattisgarh who says "achche din nahin ayenge". A new entrant to the grand old party, Pathak was with the BJP-led NDA constituent Republican Party of India (Athawale) as its state vice-president for Uttar Pradesh till he joined the Congress last month in the presence of actor-turned-politician Raj Babbar. "Since I look like Modiji, people will always ask me where are the 'acche din' (good days), as promised by Modiji ahead of the 2014 Lok Sabha election. Hurt by seeing problems of the common man, I left the BJP's ally to join Congress last month," Pathak told PTI. Pathak, who has been campaigning for the Congress in various seats of the region, including Jagdalpur, Dantewada, Kondagaon and Bastar, is drawing attention in a big way from the locals who jostle to click selfies with him. On his campaign trail, Pathak always targets the prime minister, while mimicking his style, over his promises of 'good days' and depositing Rs 1.5 million in bank accounts of every Indian after retrieving black money stashed abroad. "Mitron (friends), I came here to tell you the truth that 'achche din' (good days) are not going to come. It was a false promise and please vote for the Congress which can ensure your development," he said, while addressing a small gathering in a local market here. Pathak claims he is campaigning against the BJP and Modi for the first time since 2014 and till now he used to campaign only for the saffron party and its allies. During the last Lok Sabha polls, there were several lookalikes of Modi, including Pathak, who were seen in different places across the country during election campaigns. However, sitting Congress MLA Devti Karma, who is again contesting the election on the party ticket, said she is not even aware about any Modi lookalike campaigning for her. Devti, who is the wife of Salwa Judum founder late Mahendra Karma, said she is seeking votes in the name of her late husband. Karma is said to have mobilised the controversial movement against Naxals in Chhattisgarh and he was killed by the left-wing extremists in 2013, days ahead of the state assembly elections that year. Local Congress leaders, who are accompanying Pathak, however, said his unique way of campaigning is helping them in reaching out to BJP voters. The BJP candidate, Bhima Mandavi, however, said that the Congress resorting to using a Modi lookalike for the campaign proves the prime minister's popularity only. "People here are very wise. They can differentiate between the original and the fake. There is only one Modi, there cannot be another," Mandavi said. Incidentally, Pathak has been campaigning in the region at a time Modi himself is scheduled to address a rally in Jagdalpur on Friday. The voting for the 12 assembly seats of the Bastar region will be held on November 12.